But in the moments just before Maher's kick, there were plenty of doubtful instances. Then, early in the game-winning drive, Lions defensive lineman Da'Shawn Hand knocked the ball out of Dallas quarterback Dak Prescott's grip. 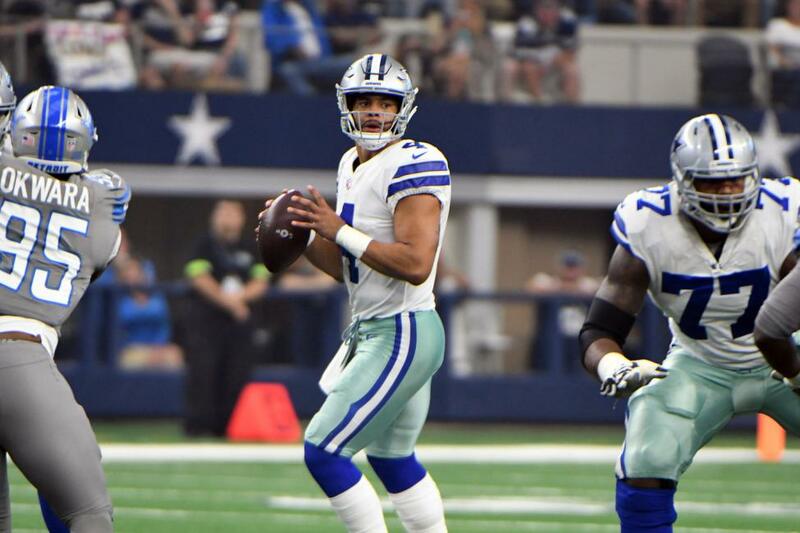 But Prescott chased down the ball, scrambled and threw it out of bounds to set up a third-and-three instead of a third-and-long. "We're prepared for that," Prescott said. "It's something that we do every week. I can't say that we necessarily fumble the ball and have to go and get it like that and make that happen, be able to throw it away. But we practice that all week long. We went out there and executed. Coach Linehan dialed them up and we got the win." "Talk about a nut-cutting-time throw," Cowboys head coach Jason Garrett said. "Critical situation to make that throw and for Zeke to be able to finish and put us in position for the game-winner was big time." Four plays later, Maher went into the game and made the game-winning kick. "That was something I haven't really run into as a problem for myself," Maher said about doubting his ability to make a game-winning field goal. "Every time I step on the field, I think I'm going to make the kick." When the officials raised their arms, the crowd at AT&T Stadium let out a roar and the Cowboys players rushed on to the field to celebrate. Dallas (2-2) cut longtime kicker Dan Bailey on Sept. 1, heaping the pressure to make Sunday's 38-yarder and justify the team's move. "I'm glad I wasn't trying to kick the field goal," Cowboys owner Jerry Jones said. "I think that's as much pressure as you can put on somebody. He had a big day. He really should be applauded." Maher's kick made Dallas' best offensive game this season stand up. Elliott ran for a season-high 152 yards on 25 carries and also caught four passes for 88 yards and a touchdown. Prescott passed for a season-high 255 yards and a pair of scores. Stafford shrugged off three sacks by passing for 307 yards and two touchdowns of his own. He led the Lions back from a 20-10 deficit to take the lead in the final three minutes. Stafford's second touchdown looked like it would lift the Lions (1-3) to their second win and deal a gut punch to the Cowboys' season. "I've been a part of some crazy ones," Stafford said. "As far as time goes and the situation, we had plenty (on their go-ahead drive in the fourth quarter). We were still just playing ball. We made some big plays on that drive there at the end. It helped us score quickly. Dallas did a nice job of answering."